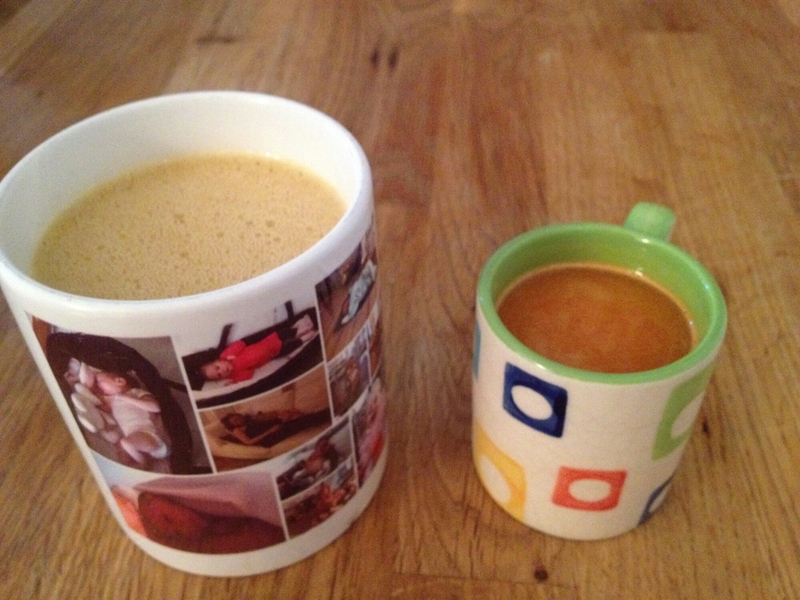 When hubby and I first went Paleo two and a half years ago, we got really into bulletproof coffee. It entails chucking a black Americano into the whizzer, along with a big knob of unsalted butter and a dash of coconut oil. Sounds a bit weird but don’t knock it until you’ve tried it! Trust me, this drink is better than any skinny latte Starbucks could whip you up. I drank them daily for months and loved the kick start to my morning. The combination of caffeine and good fats not only tastes amazing, but is magical for getting the metabolism going. This drink satisfies me until lunchtime. Around Xmas 2012 I knew I’d developed new food intolerances, so went to see our allergy nurse a few days before new years. She delivered a huge blow: I’d need to exclude coffee, cocoa, cashew nuts and butter. I didn’t know about the wonders of ghee back then, which is butter that has been clarified and the milk proteins removed. What would I do without my caffeine crutch; my chocolate pick me ups and my favourite nuts?! I was super strict with my elimination diet for a couple of months, at which point I was able to start reintroducing the problem foods. Then I had to be careful not to overdo them. Shortly after this I became intolerant of a handful of other things, and had to do another diet. 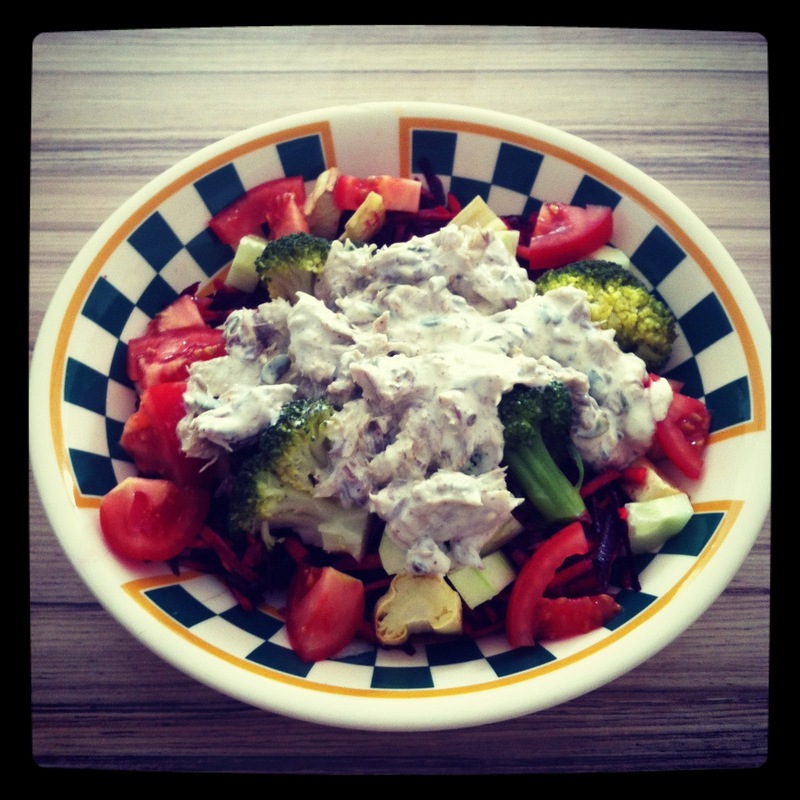 This is why I’m on GAPS – elimination diets are boring and annoying in equal measure. Hopefully once my gut lining is healed and my good gut bacteria is winning against the bad, food intolerance will become a thing of the past! So anyhoooo, on with the recipes for mine and baby boy’s current breakfast of choice! Baby boy is doing well with his weaning. For his breakfast every morning, he’s been having carrot juice which he absolutely loves! 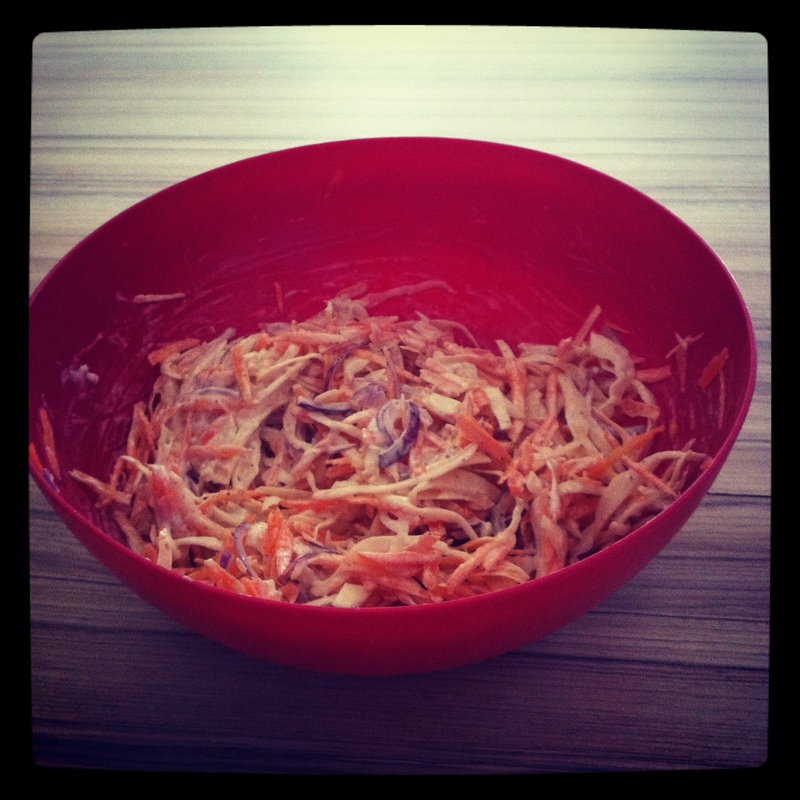 Yesterday’s concoction was half a carrot, a slice of apple, half an apricot and a few shreds of cabbage. We don’t have a juicer so the way I make this is by chucking all ingredients into the blender, covering with about 50ml of water and whizzing on high until fully combined. I then pass it through a fine mesh sieve and am left with juice that looks like the photo above. On the run up to my little girls birthday party (which was only a few weeks ago but feels like a lifetime) we had some beautiful golden beetroot in our VegBag. I’d never even heard of it before last year, but am thrilled each time it appears now and can’t get enough of it! It’s very beetrooty on the surface but golden yellow in colour once peeled, very sweet and doesn’t get you nearly as messy when preparing it as the traditional stuff does. Since starting to use beetroot as a salad base last winter, I’ve become very partial to this dish and it was a great success as side for the chicken drumsticks and sausages at the party. I made a mountain as you can see in the photo and it was all gone within half an hour. All you need to do is grate equal amounts of raw, peeled beetroot and raw, peeled carrot (I did about a kilo of each), then add a big sprinkling of mixed seeds and dress with extra virgin olive oil and balsamic vinegar to taste. Completely delicious for any occasion. And if you can’t get hold of the golden variety, red beets work just as well. If you have a grating function on a kitchen gadget use it! I was grating by hand for months before having a brainwave and throwing everything into my Vitamix. Now this dish literally takes seconds to create. I can’t take credit for the basis of this salad – a dear friend put me on to it and I’m so pleased she did. 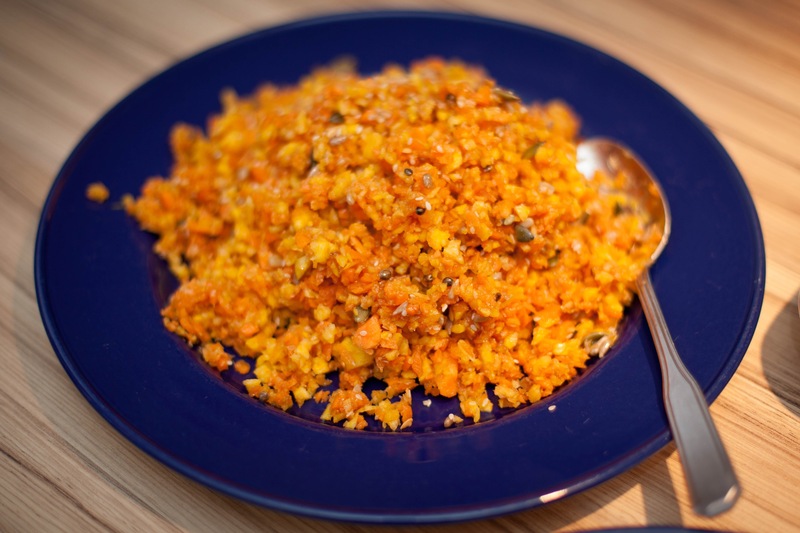 I love the idea of mostly only eating seasonal ingredients, and here in the UK carrot and beetroot can be found everywhere. It’s a bit more time consuming than opening a bag of mixed leaves, but so worth it and very filling. Although a seemingly strange addition to this salad, the pear is definitely my ‘secret ingredient’ adding just the right amount of sweetness without over powering. Here’s what I’ve been eating daily for the past few weeks. I get really upset when I hear people say they ‘don’t have time to cook’ and give their kids processed food. 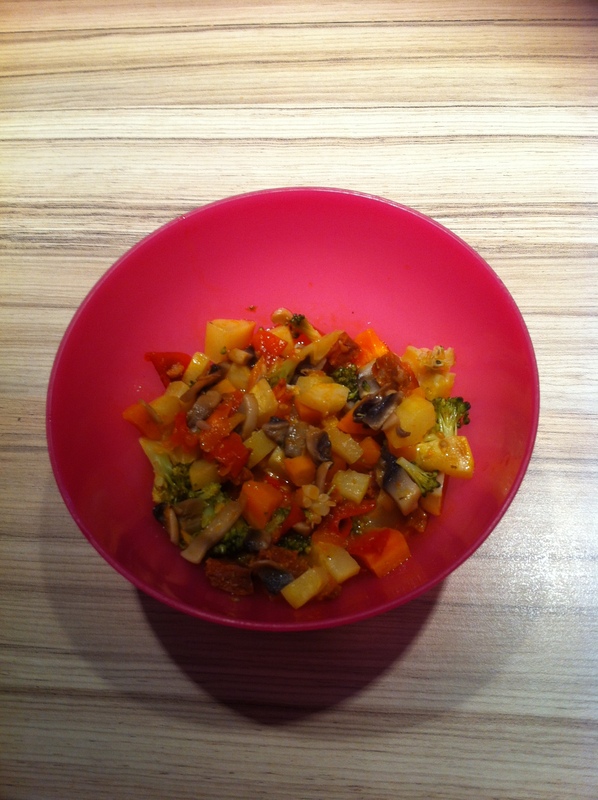 This healthy, nutritious, tasty meal took about two mins to prepare and five to cook. Are you really telling me you can’t find seven minutes for your most precious asset? !